Welcome to our online duty of care training course for healthcare and social care providers. 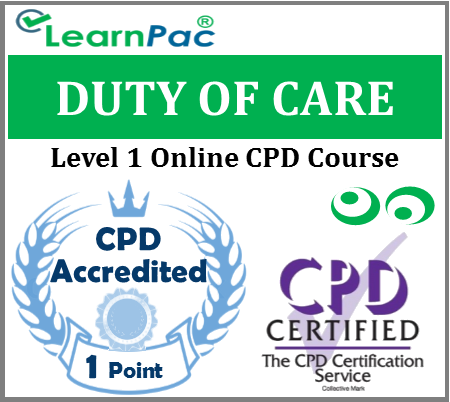 Our online duty of care training course was developed in line with the latest UK legislation and meet the requirements set out in the Care Certificate, the the National Health Service (NHS), Skills for Health’s UK Core Skills Training Framework (CSTF), the Care Quality Commission (CQC), Skills for Care, UK Health and Safety Executive (HSE) and other professional and regulatory bodies. What is covered in this online duty of care training course? Your duty of care is also to other workers, for example, in a hospital, to doctors, nurses and healthcare support workers but also to caterers, cleaners and maintenance workers. If you are a home care worker you will probably work alone in a variety of homes, but there may well be other people in the premises, as well as whoever you are there to support. Your duty of care is to each individual and to the other workers you come into contact with in the community. The duty of care is part of the code of conduct for healthcare support workers and adult social care workers in England and will most likely also be in your job description. It is important that you have the knowledge and skills to act on your duty of care in your role but that you don’t work beyond it. first time doing an online course – was glad I chose LearnPac online system , will b coming back for more courses!! !